The Royal Canadian Air Force is Back! So here we have another new modeling magazine from the British Isles. 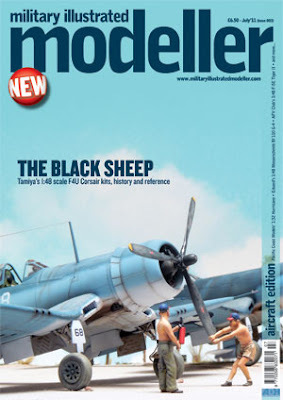 Military Illustrated Modeller is the latest title from the ADH Publishing house and the aircraft issues are edited by Brett Green of Hyperscale fame. Half of the issues are aircraft and the other half are armor. Of course we will look at an aircraft issue. First off, I'm still not sure what distinguishes this magazine from ADH's Model Aircraft magazine other than the binding. This title has a more book style format then a typical magazine. Within the 66 pages we have articles on building the Eduard 1/48 Bf-110, Hasegawa's 1/32 Ki-61, Pacific Coast Models 1/32 Hurricane, Kinetic's 1/48 Mirage 2000, Blacksheep Corsairs in 1/48, AFV's 1/48 F-5E, and Wingnut Wing's Roland. Also included are short reviews on the Kinetic 1/48 Tracker and Eduard Fw-190D. Notice something? Oh yea, that's right, not a single mention of 1/72. And outside of a quick aside about the Platz Global Hawk, there was no 1/72 modeling in Issue 001. Heck, even the preview of Issue 005 is devoid of 1/72. I guess what that could teach us is that the Hyperscale's discussion boards are right, 1/72 is not for the serious modeler. In actuality, it shows us that ADH and this magazine have bought into the hype that 1/72 is a dead scale, when in reality that is so far from the truth it is almost funny. Anyone could have that opinion, and perhaps the hype is all 1/48 and 1/32, but take a look at tables at shows. What do you see? Often more build 1/72 scale kits than the other scales combined. That aside, the models are well built, the photography excellent, and there are actual words on the pages. Again, maybe too many pictures and not enough words, but better than some of the magazines. Where this title shines is in the editing...not a typo to be found. Shocking that in the UK modelling magazine press that is a positive and not the norm. The title does feature that rather annoying style of "Part 1 in this issue, Part 2 next time," which seems to be a feature of almost every modeling mag. Come on guys, we know you want to sell magazines, but readers might like to actually finish the article in one sitting. The magazine reminds me of the highly priced, but very nice Air magazine, also from the UK. Overall a really nice title, but not necessarily one for the small scale modeler.